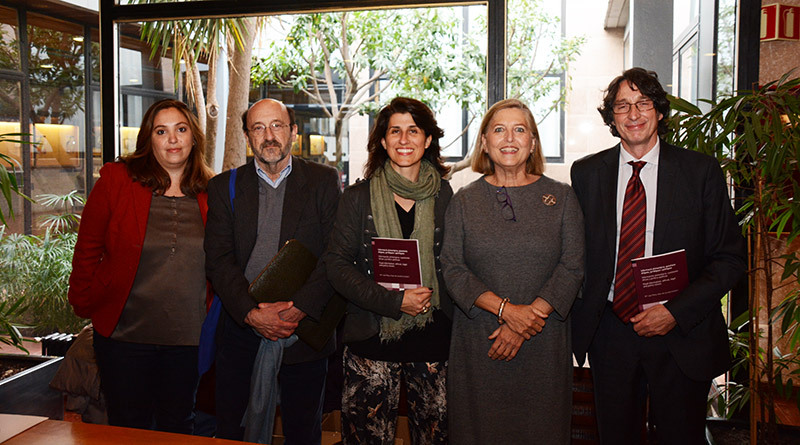 On Monday 27th of March was launched in the Law School of the University of Barcelona the Document Food information: ethical, legal and policy issues elaborated by the Opinion Group of the Bioethics and Law Observatory of the University of Barcelona. It has been coordinated by Maria José Plana, lawyer and director of the Master in Food, Ethics and Law, and Itziar de Lecuona, professor, deputy director of the Bioethics and Law Observatory and member of the University of Barcelona's Bioethics Commission. The presentation of the Document has been chaired by María Casado, director of the OBD, the Master in Bioethics and Law and director of the UNESCO Chair in Bioethics at the University of Barcelona and has included the contributions of the coordinators of the Document, Jordi Portabella, director of the Department of Research and Knowledge of Fundación Bancaria la Caixa, and the researcher Pere Puigdomenèch, member of CSIC and the European Group of Ethics in Science and New Technologies and one of the signers of the text. This Document is launched in a key moment. It shows how the regulation of advertising and labelling works and exposes the differences between the legal definitions and socially recognized meanings of key concepts in the labelling of foods, such as “organic”, “light” or “natural”. Consumer calls for an informative labelling of food products. María José Plana, has highlighted that we have made great progress regarding food information. We have more information regarding food safety and food frauds but nowadays consumers also aim at knowing in which conditions the product has been produced and which are the environmental effects of its elaboration. Thus, this Document is launched in a key moment. It shows how the regulation of advertising and labelling works and exposes the differences between the legal definitions and socially recognized meanings of key concepts in the labelling of foods, such as “organic”, “light” or “natural”. Moreover, it highlights the importance of establishing quality criteria concerning the food information that consumers can fine on the internet. Due to the fact that sometimes it is difficult to set a line between a rigorous dietary recommendation and a product advertisement. The Document also highlights the role of public authorities as guardians of the system and food frauds detectors. Consumers have more information regarding food safety and food frauds but nowadays consumers also aim at knowing in which conditions the product has been produced and which are the environmental effects of its elaboration. Through the analyses and the interdisciplinary research of food information, the Document ends with a set of recommendations addressed to public authorities, industry and research and innovation centers, media and content providers and citizens. The recommendations aim at creating an impact to stakeholders, especially, fostering an informed and engaged consumer. Finally, Dr. Pere Puigdomènech has closed the event highlighting three main points: Food is a right, it has to be safe and we have to work together in order to tackle that future generations can reach the same degree of food that we have assimilated.